Whenever we go to the grocery store to buy some goods or we go shopping, we usually return home carrying dozens of plastic bags which will eventually end up as litter on the streets or if we act green and re-use them as garbage bags, they’ll end up being thrown in the landfill! This is very harmful to our environment. Plastic bags can cause serious environmental problems; they are made of a petroleum product called polyethylene. They are not biodegradable, and therefore they take over 1000 years to break down into small toxic particles which contaminate both soil and water. Furthermore, they get carried away by the wind into forests, lakes or rivers and enter the food chain when animals mistake them for food. Hundreds of thousands of marine mammals such as dolphins, whales, sea turtles die annually by ingesting discarded plastic bags they mistake for food. And even worse, these bags remain intact even after the decomposition of these animals causing more victims of marine life to suffer this painful death whether by choking or having their intestines wrapped with a plastic bag. The United Nations Environment Programme estimates that there are 46,000 pieces of plastic litter floating in every square mile of the ocean; they also released a report in 2009 analyzing the marine litter found in 12 different parts of the world. After he read the results, United Nations Under-Secretary General Achim Steiner called for a ban on single-use plastic bags. In addition, the production of plastic bags contributes to air pollution, energy consumption and adds to the Green House Gas emissions which are responsible for Global Warming. The amount of petroleum used to make 1 plastic bag would drive a car about 11 meters. Why would we waste that amount of energy to produce a plastic bag that will pollute our environment when we have other alternatives that can be used instead?! 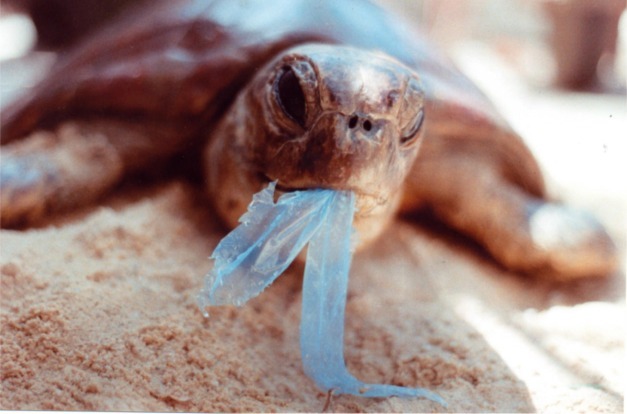 According to the National Geographic News, people worldwide use between 500 billion and 1 trillion plastic shopping bags each year, this poses a huge threat to the environment. Some people turn to paper bags as an eco-friendly alternative to plastic, but these bags are as bad as using plastic bags or even worse! Paper bags generate more pollution than plastic ones and cost more to produce, according to the “Pocono Record.” In the other hand, reusable bags made from organic cotton or biodegradable bags made from organic materials that break down quickly such as sugar cane or fruit waste are the most convenient alternatives so far as they have minimal impact to the environment. For most of us, plastic bags are part of our daily life, but their impacts on animals, landfills and the environment in general are enough reasons for us to act more environmentally friendly and start using alternatives.